Taylor Sawmill in Derry, New Hampshire, is a water powered, vertical sawmill and operates during the summer months. It’s open two Saturdays a month, and when the water behind the dam is high enough to turn the overshot wheel. 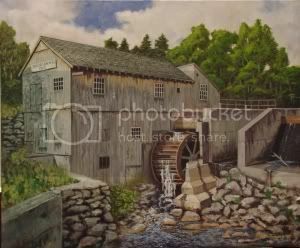 This entry was posted in Paintings and tagged Sawmill, Water. Bookmark the permalink.